Meatloaf is a meat dish usually consisting of ground meat (usually ground beef or a combination of ground beef and lamb, or pork), which is formed into a loaf shape and baked or smoked. The loaf shape is formed by either cooking it in a loaf pan, or forming it by hand on a flat baking pan. 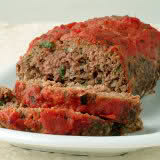 Making meatloaf especially during holidays can be a good business opportunity for home business owners. You can sell it to your friends, to your neighborhood or to food shops and restaurants. Here are 3 different, easy to make, recipes for meatloaf. – Beat eggs, water, and approximately two tablespoons of soy sauce together in a separate bowl and set aside. – Get a large bowl and mix the ground beef and stuffing together. Make sure to use your hands and combine the mixture well, as this is the most important step. – Slowly work the egg mixture into the meat and stuffing, once again making sure to combine all ingredients well. – Pick up big ball of meat and pack in hands until you have formed a loaf. – Place in ungreased loaf pan and place on center rack in oven for 45-55 minutes uncovered until center of meatloaf is browned. Drain excess grease off side of pan and let stand 5-10 minutes before cutting and serving. – Mix meat, eggs, and spices. – Mix in vegetables and crackers. – Drain off grease when brown 10-20 minutes. – Total baking time 1.5-2 hours. – Preheat the oven to 350 degrees Fahrenheit. – Pound the Ritz crackers until fine like bread crumbs. – Mince the onion until fine. – In a separate bowl, add the meat and the other ingredients and mix with your hands until the ingredients are all mixed together and the mixture is smooth. – Grease a glass baking pan with vegetable shortening. – Put the meat mixture in the pan and shape like a football. – Bake in the oven for 1 hour. – Take out the meat loaf and serve warm. Do you like this Money Making Business ideas? then please consider subscribing to our RSS feed and have new articles sent directly to your inbox.